“You just sit there and watch him, I love watching whether it’s on TV or live. Hopefully, he doesn’t get to do too much this week, because that means our defense is doing great things.” — Ben, on New England Patriots quarterback Tom Brady, from the article below. 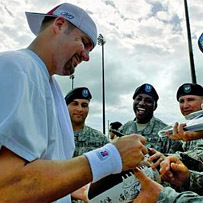 When Roethlisberger joined the Steelers in 2004, he considered the Patriots’ Brady to be the NFL’s pre-eminent quarterback. Certainly, Brady’s numbers were good enough, but it was his determination to win that most impressed the ever-competitive Roethlisberger. Six years later, Roethlisberger has won two Super Bowls himself, putting him only one behind Brady. Still, his opinion hasn’t changed — to Roethlisberger, the quarterback he’ll oppose Sunday night in Heinz Field is the NFL’s gold standard. “Tom Brady, who I think is probably the greatest in the game right now, is on the other side, so to watch him go against this great (Pittsburgh) defense is fun as well,” Roethlisberger said. Some NFL players won’t acknowledge they enjoy watching a player on a different team, but that’s not difficult for Roethlisberger. Well-known for his can’t-beat-me attitude — his teammates say he tries hard to win at everything from table tennis to garbage-basket basketball — Roethlisberger pays close attention whenever Brady is on the field. “He’s a good passer, a good leader, he seems to do a little bit of everything,” said Roethlisberger. Maybe it takes a winner to be impressed by another winner. Brady (103-32, .763) and Roethlisberger (63-27, .700) rank 1-2 among active quarterbacks in regular-season winning percentage. Counting playoff games, Brady is 117-36 (.765) and Roethlisberger is 71-29 (.710). How about Sunday at 8:20 p.m. EST? 2010 will mark the 19th anniversary of Worcester Wreath Company donating Maine wreaths to adorn the headstones of our Nation’s veterans in Arlington National Cemetery for the Holiday season. In addition to the 15,000 wreaths destined for Virginia, Worcester Wreath will once again donate 7 ceremonial wreaths to over 410 State, National and local cemeteries across the Country. In 2009 wreath-laying ceremonies were coordinated in 24 foreign cemeteries and aboard Naval ships on all Seven Seas, this tradition continues in 2010. The goal is to one day see every veteran’s grave in the country adorned with a wreath to honor them during the holiday season. You can help this wonderful project by sponsoring a wreath! Sponsorships are just $15 each. Proceeds from sponsorships not only place a wreath at one of the participating cemeteries, but also assist in supporting their fundraising partners, and supporting educational and veterans service outreach programs. For more information and to be a sponsor, click here. *Thank you to Chuck Stewart!